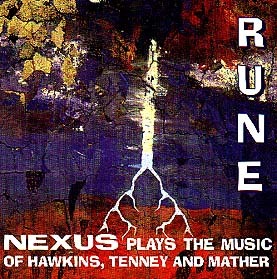 The NEXUS CD Rune features three major works commissioned by and composed for NEXUS by award-winning Canadian composers John Hawkins, James Tenney and Bruce Mather. It also features cover art by Regan Morris: two works entitled Lightning and Lightning #2. Scrubbed, scraped, cracked, with the weave of the rough canvas showing through gaps in the richly-coloured paint, these two works speak straight to the gut. Educated at the Ontario College of Art and Design (OCAD) in Toronto, Canada, Morris has enjoyed a highly successful career as an artist, widely known for his 85-piece series called “Moat,” and for his depiction of “Oscar Wilde’s Last Words,” a gigantic mural that measures 54 feet by 10 feet. His work has garnered extensive acclaim. NEXUS’ Rune was released in 1997. A 1997 article by Robin Metcalfe in International Contemporary Art magazine, called Resist: Regan Morris, symmetry & stain, described Morris’s then most-recent body of work as “employing the paper cut-out both as a visual motif and as a technical means of generating images within the complex method of his peeled paintings.” Metcalfe describes Morris’s process as being “of his own invention, whereby most of his finished works consist of second-generation peelings from a primary source painting”. You can see an untitled dyptych from this period here. Morris’s 1995 exhibition/installation in collaboration with Nadine Norman was a notable departure from his painting – a foray into sculptural assemblage that posited “an institutional shower as a confluence of personal, historical and cultural waters”, as the media release said. Playful but careful and stark, the exhibition, called Lifebuoy, was a collection of thematically related objects. Lifebuoy was one in a series of six exhibitions initiated by curatorial team Max Streicher and Jennifer McMackon. The curators’ series White Lily presents invited artists like Norman to select a collaborator with whom to create a new exhibition for Mercer Union’s Project Room, and she picked Morris. You can see images from it here. Fast-forward fifteen years to 2010 and you will find Morris’s cheerful site called “ClayBoys” online (www.clayboys.com). Here, in company with his long-time partner Michael Fitzgerald, Morris creates spectacularly irreverent cards, mugs and ceramic art tiles, and Morris provides a daily “web comic”! For a look at the Clayboys’ Astrology Tile for Gemini (NEXUS was “born” on May 22nd), click here. NEXUS is delighted to feature the work of such a wildly diverse artist as “cover art”.